Aptly named, the bigleaf maple is not only a large tree, typically growing up to 66 feet, but it’s best known for its spectacularly huge leaves which can grow to be 12 inches across. It has the largest leaves of any maple tree. The largest big leaf maple stood 160 feet high and the largest leaves found were 24 inches across! 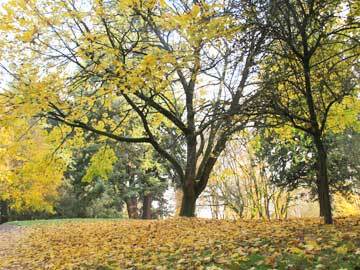 The big leaf maple is most spectacular in the fall with leaves that turn from yellow to reddish-orange. 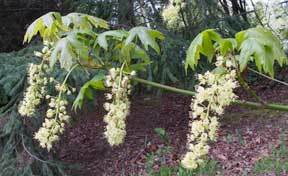 This tree is native to western North Ameica, growing mostly near the Pacific coast. In the humid parts of its range, its bark and branches are covered with epiphytic moss and fern species. Taking advantage of the rich nutrients and abundant moisture provided by these epiphytes, the big leaf maple produces a network of aerial roots in its crown that taps into the abounding epiphytic mats. In the spring, long pendulous flowers produce the familiar winged fruits known as samaras. One tree can produce a million seeds. The flowers are a great nectar source for hummingbirds as well as bees and other insects, while the seeds provide food for many songbirds and small mammals in the winter. Lakwungen First Nations people of Vancouver Island call it the “paddle tree” and used it to make paddles and spindle wheels. 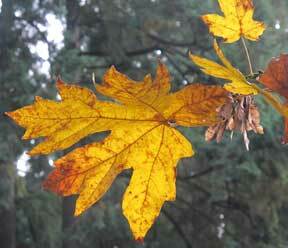 Today, it is the only commercially used maple in the Pacific coast region. The wood is used for applications as diverse as furniture, piano frames and salad bowls. The current national champion bigleaf maple is located in Marion, Oregon. It has a circumference of 25.4 feet or an average diameter at breast height of about 8.1 feet and is 88 feet tall with a crown spread of 104 feet.